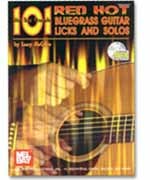 This book contains 101 authentic bluegrass guitar licks in the favorite bluegrass keys of C, G, D, and A minor. The licks are broken down into phrases of two, four, and eight bars. In addition, several endings and crosspicking licks are included. Each lick is played to a chord progression that is standard in bluegrass, country, and folk music. All 101 examples are recorded on the companion CD with guitar accompaniment at a moderate tempo. Whether you are a fan of old-time country music, traditional bluegrass, or newgrass, you are sure to find lots of great ideas in this new collection of bluegrass licks.